Peter Press "Pistol Pete" Maravich (June 22, 1947 – January 5, 1988) was an American professional basketball player. He was born in Aliquippa, Pennsylvania, part of the Pittsburgh metropolitan area, and raised in the Carolinas. Maravich starred in college at Louisiana State University (LSU) and played for three NBA teams until injuries forced his retirement in 1980. He is still the all-time leading NCAA Division I scorer with 3,667 points scored and an average of 44.2 points per game. All of his accomplishments were achieved before the three-point line and shot clock were introduced to NCAA basketball and despite being unable to play varsity as a freshman under then-NCAA rules. One of the youngest players ever inducted into the Naismith Memorial Basketball Hall of Fame, Maravich was cited by the Hall as "perhaps the greatest creative offensive talent in history". In an April 2010 interview, Hall of Fame player John Havlicek said that "the best ball-handler of all time was Pete Maravich". Pete Maravich was born to Helen Gravor Maravich (1925–1974) and Peter Press Maravich (1915–1987) in Aliquippa, a steel town in Beaver County in western Pennsylvania, near Pittsburgh. Maravich amazed his family and friends with his basketball abilities from an early age. He enjoyed a close but demanding father–son relationship that motivated him toward achievement and fame in the sport. Maravich's father, Petar "Press" Maravich, the son of Serbian immigrants and a former professional player-turned-coach, showed him the fundamentals starting when he was seven years old. Obsessively, Maravich spent hours practicing ball control tricks, passes, head fakes, and long-range shots. This dedication and inventiveness manifested itself in early success: Maravich played high school varsity ball at Daniel High School in Central, South Carolina, a year before being old enough to attend the school. While at Daniel from 1961 to 1963, Maravich participated in the school's first-ever game against a team from an all-black school. In 1963 his father departed from his position as head basketball coach at Clemson University and joined the coaching staff at North Carolina State University. The Maravich family's subsequent move to Raleigh, North Carolina, allowed Pete to attend Needham B. Broughton High School. His high school years also saw the birth of his famous moniker. From his habit of shooting the ball from his side, as if he were holding a revolver, Maravich became known as "Pistol" Pete Maravich. From there "Pistol" Maravich graduated from Needham B. Broughton High School in 1965 and then attended Edwards Military Institute, where he averaged 33 points per game. Later in life Maravich would tell friends he always desired to play basketball for West Virginia University and was originally ready to be a Mountaineer, his father was the head coach for LSU Men's Basketball and offered him a spot at the school. At that time NCAA rules prohibited first-year students from playing at the varsity level, which forced Maravich to play on the freshman team. In his first game Maravich put up 50 points, 14 rebounds and 11 assists against Southeastern Louisiana College. Second, Maravich played before the advent of the three-point line. This significant difference has raised speculation regarding just how much higher his records would be, given his long-range shooting ability and how such a component might have altered his play. Writing for ESPN.com, Bob Carter stated, "Though Maravich played before freshmen were eligible for the varsity and before the 3-point shot was established, he loved gunning from long range." It has been reported that former LSU coach Dale Brown charted every shot Maravich scored and concluded that, if his shots from three-point range would have been counted as three points, Maravich's average would have totaled 57 points per game. Third, The shot clock (45, 35, 30 seconds) was not instituted until fifteen years after Maravich left LSU. The shot clock speeds up play, mandates an additional number of field goal attempts, eliminates stall tactics, and results in higher scoring. Had the shot clock been in effect during Maravich's career at LSU, he would have scored many more points per game. More than 40 years later, however, many of his NCAA and LSU records still stand. Maravich was a three-time All-American. Though he never appeared in the NCAA tournament, Maravich played a key role in turning around a lackluster program that had posted a 3–20 record in the season prior to his arrival. 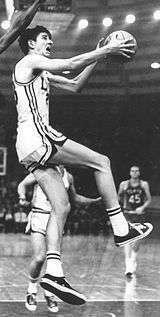 Pete Maravich finished his college career in the 1970 National Invitation Tournament, where LSU finished fourth. Maravich (with the ball) in 1974. 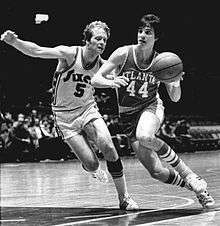 The Atlanta Hawks selected Maravich with the third pick in the first round of the 1970 NBA draft, where he played for coach Richie Guerin. He was not a natural fit in Atlanta, as the Hawks already boasted a top-notch scorer at the guard position in Lou Hudson. In fact, Maravich's flamboyant style stood in stark contrast to the conservative play of Hudson and star center Walt Bellamy. And it did not help that many of the veteran players resented the $1.9 million contract that Maravich received from the team—a very large salary at that time. Still, the rookie's talent was undeniable. Maravich appeared in 81 games and averaged 23.2 points per contest—good enough to earn NBA All-Rookie Team honors. And he managed to blend his style with his teammates, so much so that Hudson set a career high by scoring 26.8 points per game. But the team stumbled to a 36–46 record—12 wins fewer than in the previous season. Still, the Hawks qualified for the playoffs, where they lost to the New York Knicks in the first round. Maravich struggled somewhat during his second season. His scoring average dipped to 19.3 points per game, and the Hawks finished with another disappointing 36–46 record. Once again they qualified for the playoffs, and once again they were eliminated in the first round. However, Atlanta fought hard against the Boston Celtics, with Maravich averaging 27.7 points in the series. It was a sign of things to come. Maravich erupted in his third season, averaging 26.1 points and dishing out 6.9 assists per game. With 2,063 points, he combined with Hudson (2,029 points) to become only the second set of teammates in league history to each score over 2,000 points in a single season. The Hawks soared to a 46–36 record, but again bowed out in the first round of the playoffs. However, the season was good enough to earn Maravich his first-ever appearance in the NBA All-Star Game, and also All-NBA Second Team honors. The following season (1973–74) was his best yet—at least in terms of individual accomplishments. Maravich posted 27.7 points per game—second in the league behind Bob McAdoo—and earned his second appearance in the All-Star Game. However, Atlanta sank to a disappointing 35–47 record and missed the postseason entirely. In the summer of 1974, an expansion franchise was preparing for its first season of competition in the NBA. The New Orleans Jazz were looking for something or someone to generate excitement among their new basketball fans. With his exciting style of play, Maravich was the perfect man for the job. Additionally, he was already a celebrity in the state due to accomplishments at LSU. To acquire Maravich, the Jazz traded two players and four draft picks to Atlanta. The expansion team struggled mightily in its first season. Maravich managed to score 21.5 points per game, but shot a career-worst 41.9 percent from the floor. The Jazz posted a 23–59 record, worst in the NBA. Jazz management did its best to give Maravich a better supporting cast. The team posted a 38–44 record in its second season (1975–76) but did not qualify for postseason play, despite the dramatic improvement. Maravich struggled with injuries that limited him to just 62 games that season, but he averaged 25.9 points per contest and continued his crowd-pleasing antics. He was elected to the All-NBA First Team that year. The following season (1976–77) was his most productive in the NBA. He led the league in scoring with an average of 31.1 points per game. He scored 40 points or more in 13 different games, including a 68-point masterpiece against the Knicks. At that time, it was the most points ever scored by a guard in a single game, and only two players had scored more points in a game: Wilt Chamberlain and Elgin Baylor. Baylor was head coach of the Jazz at that time. Maravich earned his third all-star game appearance and was honored as All-NBA First Team for the second consecutive season. The following season, injuries to both knees forced him to miss 32 games during the 1977–78 season. Despite being robbed of some quickness and athleticism, he still managed to score 27.0 points per game, and he also added 6.7 assists per contest, his highest average as a member of the Jazz. Many of those assists went to new teammate Truck Robinson, who had joined the franchise as a free agent during the off-season. In his first year in New Orleans, he averaged 22.7 points and a league-best 15.7 rebounds per game. His presence prevented opponents from focusing their defensive efforts entirely on Maravich, and it lifted the Jazz to a 39–43 record—just short of making the club's first-ever appearance in the playoffs. Knee problems plagued Maravich for the rest of his career. He played in just 49 games during the 1978–79 season. He scored 22.6 points per game that season and earned his fifth and final All-Star appearance. But his scoring and passing abilities were severely impaired. The team struggled on the court, and faced serious financial trouble as well. Management became desperate to make some changes. The Jazz traded Robinson to the Phoenix Suns, receiving draft picks and some cash in return. However, in 1979, team owner Sam Battistone moved the Jazz to Salt Lake City. The Utah Jazz began play in the 1979–80 season. Maravich moved with the team to Salt Lake City, but his knee problems were worse than ever. He appeared in 17 games early in the season, but his injuries prevented him from practicing much, and new coach Tom Nissalke had a strict rule that players who didn't practice were not allowed to play in games. Thus, Pistol Pete was parked on the bench for 24 straight games, much to the dismay of Utah fans and to Maravich himself. During that time, Adrian Dantley emerged as the team's franchise player. The Jazz placed Maravich on waivers in January 1980. He signed with the Celtics, the top team in the league that year, led by rookie superstar Larry Bird. Maravich adjusted to a new role as part-time contributor, giving Boston a "hired gun" off the bench. He helped the team post a 61-21 record in the regular season, best in the league. And, for the first time since his early career in Atlanta, Maravich was able to participate in the NBA playoffs. He appeared in nine games during that postseason, but the Celtics were upended by Julius Erving and the Philadelphia 76ers in the Eastern Conference finals, four games to one. Realizing that his knee problems would never go away, Maravich retired at the end of that season. It is noteworthy that the NBA instituted the 3-point shot just in time for Pistol Pete's last season in the league. He had always been famous for his long-range shooting, and his final year provided an official statistical gauge of his abilities. Between his limited playing time in Utah and Boston, he made 10 of 15 3-point shots, giving him a career 67% completion rate behind the arc. During his ten-year career in the NBA, Maravich played in 658 games, averaging 24.2 points and 5.4 assists per contest. In 1987, he was inducted into the Naismith Memorial Basketball Hall of Fame, and his #7 jersey has been retired by both the Jazz and the New Orleans Pelicans. Maravich scored 50 or more points six times and 40 or more points thirty-five times in the regular season. Maravich's career high in the playoffs was 37 points. After injuries forced his retirement from the game in the fall of 1980, Maravich became a recluse for two years. Through it all, Maravich said he was searching "for life". He tried the practices of yoga and Hinduism, read Trappist monk Thomas Merton's The Seven Storey Mountain and took an interest in the field of ufology, the study of unidentified flying objects. He also explored vegetarianism and macrobiotics. Eventually, he embraced evangelical Christianity. A few years before his death, Maravich said, "I want to be remembered as a Christian, a person that serves Him [Jesus] to the utmost, not as a basketball player." On January 5, 1988, Maravich collapsed and died of heart failure at age 40  while playing in a pickup basketball game in the gym at First Church of the Nazarene in Pasadena, California, with a group that included James Dobson. Maravich had flown out from his home in Louisiana to tape a segment for Dobson's radio show that aired later that day. Dobson has said that Maravich's last words, less than a minute before he died, were "I feel great." An autopsy revealed the cause of death to be a rare congenital defect; he had been born with a missing left coronary artery, a vessel that supplies blood to the muscle fibers of the heart. His right coronary artery was grossly enlarged and had been compensating for the defect. Maravich died the year after his father's passing and a number of years after his mother, who had committed suicide with a self-inflicted gunshot. Maravich is buried at Resthaven Gardens of Memory and Mausoleum in Baton Rouge, Louisiana. Maravich was survived by his wife Jackie and his two sons Jaeson, who was 8 years old, and Josh, aged 5. Only the previous year, Maravich had taken Jaeson to the 1987 NBA All-Star Game in Seattle, Washington, and introduced him to Michael Jordan. Since Maravich's children were very young when he died, Jackie Maravich initially shielded them from unwanted media attention, not even allowing Jaeson and Josh to attend their father's funeral. However, a proclivity to basketball seemed to be an inherited trait. During a 2003 interview, Jaeson told USA Today that, when he was still only a toddler, "My dad passed me a (Nerf) basketball, and I've been hooked ever since... . My dad said I shot and missed, and I got mad and I kept shooting. He said his dad told him he did the same thing." Despite some setbacks coping with their father's death and without the benefit that his tutelage might have provided, both sons eventually were inspired to play high school and collegiate basketball—Josh at his father's alma mater, LSU. On June 27, 2014, Governor Bobby Jindal proposed that LSU erect a statue of Maravich outside the Assembly Center which already bears the basketball star's name. Former coach Dale Brown opposes such a monument, but Maravich's widow, Jackie McLachlan, said that she had been promised a statue after the passing of her husband. McLachlan said that she has noticed how fans struggle to get the Maravich name on the Assembly Center into a camera frame. Maravich's untimely death and mystique have made memorabilia associated with him among the most highly prized of any basketball collectibles. Game-used Maravich jerseys bring more money at auction than similar items from anybody other than George Mikan, with the most common items selling for $10,000 and up and a game-used LSU jersey selling for $94,300 in a 2001 Grey Flannel auction. The signed game ball from his career-high 68 point night on February 25, 1977, sold for $131,450 in a 2009 Heritage auction. In 1987, roughly a year before his death, Maravich co-authored an autobiography titled Heir to a Dream that devoted much focus to his life after retirement from basketball and his later devotion to Christianity. After Maravich's death, Louisiana Governor Buddy Roemer signed a proclamation officially renaming the LSU home court the Pete Maravich Assembly Center. In 1991, a biographical film dramatizing his 8th grade season entitled The Pistol: The Birth of a Legend was released. In 1996, he was named one of the 50 Greatest Players in NBA History by a panel made up of NBA historians, players, and coaches. He was the only deceased player on the list. At the 1997 All-Star Game in Cleveland, he was represented by his two sons at halftime. In 2001, a comprehensive 90-minute documentary film debuted on CBS entitled Pistol Pete: The Life and Times of Pete Maravich. In 2005, ESPNU named Maravich the greatest college basketball player of all time. In 2007, two biographies of Maravich were released: Maravich by Wayne Federman and Marshall Terrill and Pistol by Mark Kriegel. The Ziggens, a band from Southern California, wrote a song about Maravich entitled "Pistol Pete". #7 jersey retired by the New Orleans Hornets (2002), even though he never played for them—one of only four players to have a number retired by a team they did not play for; Maravich did play professionally for the New Orleans Jazz, however, and has remained a greatly admired figure amongst New Orleans sports fans ever since. David Thompson of the Denver Nuggets also scored 40 points in this game. ↑ "The Naismith Memorial Basketball Hall of Fame – Hall of Famers". Hoophall.com. 1988-01-05. Retrieved 2015-05-09. ↑ "What If——-Pete Maravich?". Thomaston Times. Retrieved 2013-05-04. ↑ "The My Hero Project – Pete Maravich". Myhero.com. Retrieved 2015-05-09. ↑ "Serbica Americana – Pete Maravich". Eserbia.org. Retrieved 2015-05-09. ↑ Kriegel, Mark. "'Pistol' Draws a Bead on Pete Maravich". NPR.org. Retrieved 2015-05-09. ↑ Jennings, Jay (February 11, 2007). "Crowd Pleaser". The New York Times. Retrieved 2012-01-14. ↑ "Pistol: The Life of Pete Maravich". Amazon.com. Retrieved 2012-01-14. ↑ "Pete Maravich Summary". NBA.com. Retrieved 2010-09-06. 1 2 "Pete Maravich Bio". NBA.com. Retrieved 2015-05-09. ↑ Federman, Wayne; Terrill, Marshall; Maravich, Jackie (2006). Maravich. p. 68. ISBN 1-894963-52-0. ↑ Medcalf, Myron (2014-08-18). "What if 'Pistol' Pete had a 3-point line?". ESPN.com. ESPN. Retrieved 2015-09-16. ↑ Diaz, Angel; Erwin, Jack; Warner, Ralph (2012-03-02). "The 25 Most Unbreakable Records in Sports History". Complex.com. Retrieved 2015-09-16. ↑ Steve Bunin, Bill Walton (2006). Remembering Pete Maravich (Television production). The Hot List. Event occurs at 1:56. Retrieved 2015-10-03. ↑ At this time, freshmen did not play on the varsity team and these stats do not count in the NCAA record books. 1 2 3 "Pete Maravich NBA Stats". Basketball-Reference.com. Retrieved 2015-05-09. ↑ "1970 NBA Draft". Basketball Reference. Retrieved October 31, 2008. ↑ "'Pistol' Pete Maravich – Career Recap – LSUsports.net – The Official Web Site of LSU Tigers Athletics". LSUsports.net. Retrieved 2015-05-09. ↑ "Most points by 1 player in a NBA game, 50 point games in NBA history". Nbahoopsonline.com. Retrieved 2015-05-09. ↑ Archived June 26, 2015, at the Wayback Machine. ↑ Linda Hamilton (2004-11-02). "25 years later the Jazz are going strong". Deseret.news.com. Retrieved 2015-05-09. ↑ "Maravich Is Eulogized". The New York Times. 1988-01-10. Retrieved 2015-05-09. ↑ Archived August 7, 2013, at the Wayback Machine. ↑ Thamel, Pete (February 17, 2004). "In the Name of His Father: The Journey of Pete Maravich's Son". The New York Times. Archived from the original on August 5, 2009. Retrieved May 22, 2010. 1 2 Weir, Tom (February 14, 2003). "Playing in Pistol Pete's shadow". USA Today. Retrieved May 22, 2010. ↑ "Josh Maravich Stats, Bio – ESPN". Espn.go.com. Retrieved 2015-05-09. ↑ Michelle Millhollon (June 27, 2014). "Jindal to LSU: How about a statue of Pete Maravich?". Baton Rouge Morning Advocate. Retrieved June 27, 2014. ↑ "Demand for Pistol Pete memorabilia is stronger tha". Sports Collectors Digest. 2007-12-21. Retrieved 2015-05-09. ↑ "1977 Pete Maravich Sixty-Eighth Point Game Used Basketball Basketball Collectibles: Balls". Sports.ha.com. Retrieved 2010-09-06. ↑ "Pistol Pete Lyric Meaning – The Ziggens Meanings". Songmeanings.net. Retrieved October 17, 2012. ↑ "Remember the Name: Ben Woodside". Sports.espn.go.com. Retrieved 2015-05-09. ↑ New Jersey Nets vs. Miami Heat - Play By Play - December 23, 2005 - ESPN (4th quarter) NB: While this link only backs up the fact that Carter made 16 free throws in a quarter, there is no mention of any records broken or set. ↑ Detroit Pistons vs. Los Angeles Clippers - Recap - December 11, 2005 - ESPN NB: While this link only backs up the fact that Wallace attempted 20 free throws in a quarter, there is no mention of any records broken or set. Berger, Phil (1999). Forever Showtime: The Checkered Life of Pistol Pete Maravich. Taylor Trade. ISBN 0-87833-237-5. Federman, Wayne and Terrill, Marshall (2007). Maravich. SportClassic Books. ISBN 1-894963-52-0. Federman, Wayne and Terrill, Marshall (2008). Pete Maravich: The Authorized Biography of Pistol Pete. Focus on the Family/Tyndale House Publishers. ISBN 1-58997-535-9. Gutman, Bill (1972). Pistol Pete Maravich: The making of a basketball superstar. Grosset & Dunlap. ISBN 0-448-01973-6. Kriegel, Mark (2007). Pistol: The Life of Pete Maravich. Free Press. ISBN 0-7432-8497-6. Maravich, Pete and Campbell, Darrel (1987). Heir To A Dream. Nashville: Thomas Nelson. ISBN 0-8407-7609-8. Towle, Mike (2000). I Remember Pete Maravich. Nashville: Cumberland House. ISBN 1-58182-148-4. Towle, Mike (2003). Pete Maravich: Magician of the Hardwood. Nashville: Cumberland House. ISBN 1-58182-374-6.